Day 1 started off with good news. Makael Buhon, who was pulled from the water in serious condition yesterday, is recovering in a nearby hospital. It is not yet known what caused the accident, but without the swift action of his fellow competitors and the El Faro staff to bring him to safety, we may have been reporting a different story. We want to give a massive thanks to everyone who helped with his rescue. The contest got under way today with strong winds and small waves. 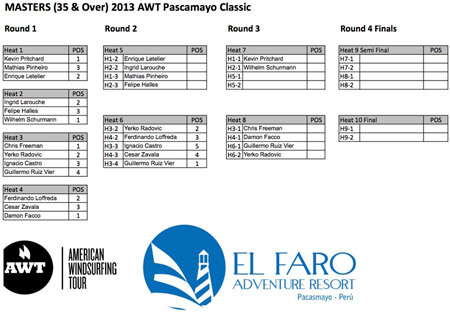 The call was made to start with the Amateur heats and move on to the Masters as well. Even though wave conditions were challenging, riders were still able to rack up long rides with critical turns. Some of todays highlights included Brazilian, Willhelm Schurmann whose powerful style and hard slashing turns impressed the judges. Also, Chris Freeman and Kevin Pritchard made their debut's as Masters riders at an AWT event. Each sailed well enough to win their heats, and advance straight to the 3rd round. We won't be seeing them in the Masters in other AWT events, but there is a special exception in South America where we abide by IFCA Rules. Amateur standouts included Canadian sensation Ingrid Larouche, winning her heat and moving on to the 3rd round. 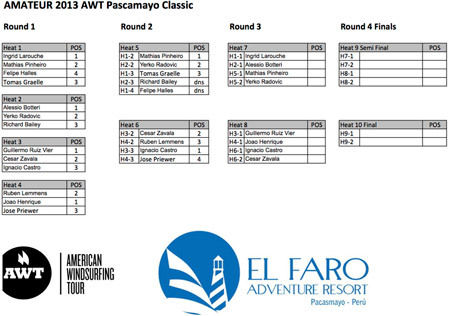 Also, 15 year old Alesio Bateri from Lima Peru, showed excellent skill in dispatching his competition, choosing the best waves and riding them with style. Stay tuned as we look for bigger waves, and hope to get the pros started soon.